Last season, The Last Man On Earth took a three-month break between its fall finale and its spring premiere. When the series finally returned, it aired an episode that didn’t feature any of the main cast and told a story about life during the viral outbreak from the perspective of Pamela (Kristen Wiig), a haughty socialite who’s wholly unprepared for post-apocalyptic life. “Got Milk?” was a welcome break from the series’ formula, but it also introduced a new type of episode that LMOE could produce in the future, something like the “Treehouse of Horror” series on The Simpsons. If LMOE will continue to introduce (and then eventually kill off) new survivors, they can also produce episodes that illustrate the survivors’ lives before, during, and after the virus. “Karl” follows roughly the same trajectory as “Got Milk?” but with less impressive results. 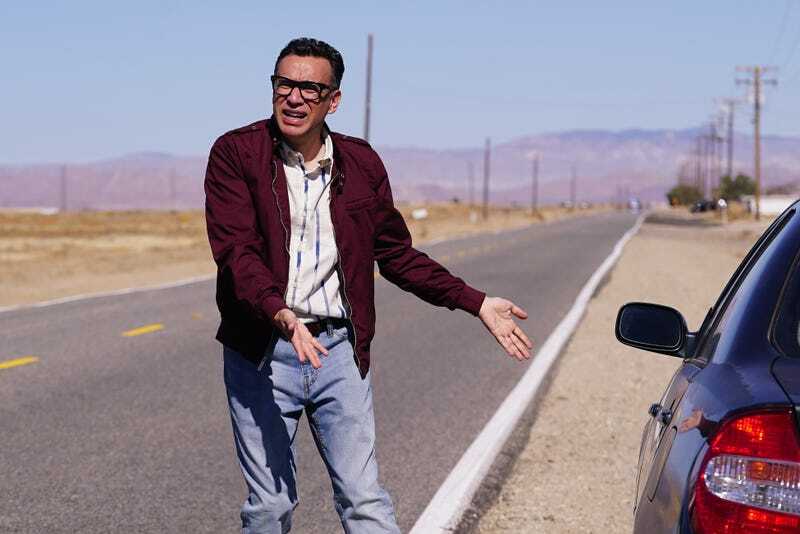 The episode stars Fred Armisen (teased in “Not Appropriate For Miners”) as Karl, a Dahmer-esque cannibalistic serial killer who projects social awkwardness instead of menace. Karl is the type of guy who would ramble about his enormous back boil on a first date, then awkwardly tip the waiter cash in the middle of ordering a meal, and then offer to paint his date after dinner. Luckily, his date Zoe (Gossip Girl’s Leighton Meester) bails before dinner even arrives because Karl is also the type of guy who stuffs heads into freezers and then later cooks them in a pot roast. A consummate pro at leaning into eccentric or off-putting characteristics, Armisen commits to playing Karl as a dork who just happens to be a compulsive cannibal. It’s a nice turn for him, and credited writer Kassia Miller gives him some good material, such as his unfortunate tendency to store his decapitated heads in easy-to-find places. Unfortunately, the character itself is fairly one note, at least here when he’s not playing off the ensemble, and “Karl” doesn’t really offer any way for the character to develop beyond “Look at this nerd who likes to eat people.” Though Karl is somewhat interesting on paper—he’s a lonely cannibal who craves companionship but can’t stop himself from murdering those who get close to him—“Karl” never effectively dramatizes his inner conflict all that well. Though it’s hard to overcome severe protagonist issues, it’s still fun to see LMOE burn through plot in “Karl.” When Karl takes his dog Zeus for a walk, he finds that the police have surrounded his apartment. He leaves his dog on the sidewalk, flees the state, kills a passing driver (Martin Short!) so he can steal his car, drives to Juarez, and crafts a new but familiar identity in under two minutes of screen time. It’s necessary for LMOE to move that quickly in these POV episodes, but it’s still a joy to see the series shift setting and tone so adeptly, even if it’s only for the first half of the episode. The second half of “Karl” follows the eponymous killer as he adjusts to life in prison, struggling not to murder and consume his fellow inmates and also confronting his “food” addiction. In prison, the virus wipes out the inmates and the guards all except for Karl and the guard Martinez (Geoffrey Rivas). Though Martinez initially keeps his distance, the two eventually share some nice late night moments playing Two Truths and a Lie over some beers. When Karl asks Martinez why he doesn’t leave the prison, he solemnly but practically tells him that his family and friends are dead, and all he has left is his job. LMOE handles the moment well, demonstrating that it can still ground its silliness in something real. Eventually, Martinez decides to leave the prison to search for other survivors, leaving two months worth of food and a noose for Karl. Karl insists he go with him, but Martinez knows that Karl can’t change his ways. Sure enough, Karl unceremoniously murders Martinez, but only because he wanted to “get out into the world and prove that he didn’t have to kill anymore.” Of course, this plan backfires because he doesn’t know the code to leave the main prison gate. So he presumably spends months, maybe years, trying every possible five number combination and devising a way to jump over the high prison walls. The last five minutes of the episode play like a condensed version of the LMOE pilot. Karl moves from frustrated-yet-determined to suicidal in record time, but just before he’s about to hang himself, Tandy and Todd show up at the prison looking for Jasper. Instead, they find Karl who has taken Martinez’s clothes and identity so he can finally get his wish. I assume that upcoming episodes of LMOE will involve a will-he-won’t-he-murder story. This coupled with Chekov’s Rubik’s cube suggests that the series is struggling to manufacture tension from the series, which is understandable given that post-apocalyptic settings that don’t feature the undead can only present so many threats to survivors. But it’s also possible that the series has other tricks up its sleeve. Let’s just hope they continue to produce side episodes like this one that allow for different ideas to flourish. Karl’s license plate is PPL PRSN. Karl could never get into The Beatles because there are “too many descending arpeggios” and I’d bet money that Armisen came up with that line himself. Two songs in this episode: The first is Macy Gray’s “I Try” and the second is Merle Haggard’s “Workin’ Man Blues.” The latter is below.